Broth and stock are staples in our home. Nutrient dense broths and stocks are not only superfoods with legendary healing properties, they are also a great way to use up every part and get the most nutrition out an animal. Lately, instead of making my regular supply of broth from fresh, pasture raised chickens on the stove (with this recipe), I’ve been making chicken stock in the slow cooker just from the carcasses of pasture raised chickens I roasted for dinner. And while the slow cooker stock tastes different and has less healthy fat than my original broth recipe, it’s yummy, as well as much easier and cheaper to make! What’s the difference, you say? Both broth and stock start with the same basic foundation: water, onions, salt, pepper and seasonings. Often both broth and stock include carrots and celery to make a mirepoix as well. Broth is then enriched with the meat of a chicken—usually a whole chicken. The mixture is simmered and strained (and the chicken is great to use for salads, tacos, etc.). Broth should be light with a clean and clear flavor. Stock starts with the same ingredients as broth, but rather than simmering it with meat, stock is made with lots of bones. Sometimes the bones are first roasted in the oven, and then added to the stock pot, creating a much deeper flavor. The bones contain a lot of natural gelatin in them so they give stock a richer “mouth feel” as well as significantly more nutrition. Stock is sometimes colloquially called “bone broth,” but chefs and cookbooks will always refer to it as stock. Since I roast a chicken two or three times a month, I freeze the necks and organs (usually packaged inside the cavity of the chicken), and then after we have eaten all the meat from the bones, I put the carcass in the freezer, too. When I have two medium or three small carcasses collected, I make the following stock. This easy crockpot chicken stock recipe is a frugal and nutritious way to reduce waste in the kitchen, improve digestive health and add flavor to your meals. 4 organic or pasture-raised chicken feet These are essential to getting a good gel. If you want a deeper, richer stock, roast the bones and veggies in a 400 degree oven until they are really well caramelized, about an hour. In the bottom of your crockpot, place roasted chicken carcasses, chicken feet, onions, veggies (if using), peppercorns, bayleaf and allspice berries. Cover everything with pure water to the maximum level your crockpot will hold. Add just 1 Tbsp. of the sea salt and 1 tsp. of the vinegar. Stir gently. Set crockpot on high for 3-4 hours, then reduce to low and simmer for 8-10 hours. When done, draw the stock off with a ladle and strain it through a cheesecloth, nut milk bag or Bouillon strainer into storage containers. After you have drawn off as much stock as you can, fill the crockpot again with pure water, and add the last Tbsp. of sea salt and 1 tsp. of vinegar. Repeat the cooking cycle once more. Again, draw off the broth with a ladle and strain it through a cheesecloth, nut milk bag or Bouillon strainer into storage jars. After two cooking cycles, the chicken bones should be very soft. You can discard them, or for a super mineral boost, purée them with a blender into a soup recipe. Use your stock in place of water to add richer flavor and greater nutrition to everything from rice to beans to soup! Your crock pot method makes great sense. Since I tend to make stock in larger quantities I have started slow cooking my stock in the oven over night. We raise our own chickens and always save the feet after processing them. The feet make a rich gelatinous stock. I made this for the first time ever! However the second batch was much lighter in color than the first batch. Is this to be expected? Yes. I often cook the second batch a little longer, or add an extra chicken foot or two. I don’t have a crockpot and am using a gas stove. I have been boiling it on med for two hours and it has reduced quite considerably. Is that normal? should I add more water or just simmer? No, you are not supposed to boil it that long. A crockpot simmers very low and slow. If you are making stock on the stovetop, first bring it to a boil, and then turn it down and simmer on very very low for 3-4 hours longer. Add water, as needed. Ok thank you! and after I simmer this for 8 hours, I can do it all over again??? one more time??? I’ve never double simmered on the stove. Give it a try and let us know how it works. Here’s my question…can I cook the whole chicken in a stock pot with your directions in the other post, with veggies, seasonings and vinegar, THEN take the bones, roast them and use this recipe for making stock?? 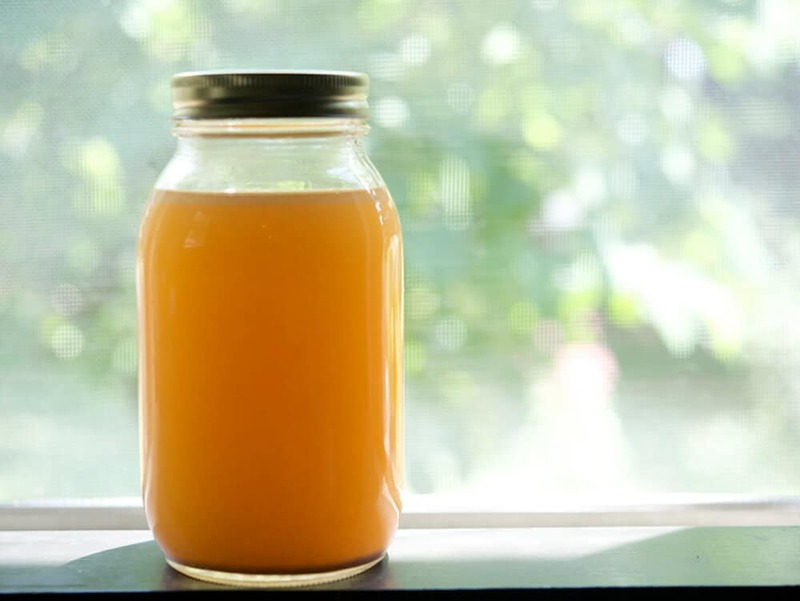 Would I end up with broth the first time and a cooked chicken, and then stock the second time that is more nutrient dense? And should they both gell? Yes, you can do that! (That’s brilliant, in fact.) Your stock may not gel much given it’s gone a second time round, but it will have the minerals from the bones. If you added a couple of additional chicken feet to the stock, you might get a better gel. Thanks for sharing! I have two questions. 1) How do I store this??? I can’t freeze mason jars, correct? and 2) when I make soups that call for chicken broth (just canned from the grocery store) do I use what the recipe calls for…of my broth that is….or is this a concentrated portion and I only need to use half of what the recipe calls for and add water? Thank you! You can freeze mason jars, but there is always the risk of them breaking. If you try it, leave at least and inch of headroom for the broth to expand. I use these BPA-free freezer jars to freeze my broth. I always use my broth full strength everywhere I can think to use it. For example, instead of cooking rice or beans in water, I sub in 100% broth. This makes anything you cook in it tastier and more nutritious. You can also place in Ziploc freezer bags and freeze flat. I do 4 cups in each bag, makes for easy storage and easy use!! My question: Why the feet? I raise chickens and I am just not a fan of chicken feet. I’m sorry, but they are always dirty and always in poo…..any foot substitute??? TIA!! The feet are one of the best sources of nutrients like collagen and glucosamine. Of course always use well-cleaned and skinned chicken feet (which you can usually buy at the store for very little). You can also use heads and necks. Thanks for sharing with Simple Meals Friday! You are one of our featured posts this week! Your explanation of the differences between broth and stock are really helpful! I’m definitely planning to use your “easy” method for chicken stock so I won’t be tied to the kitchen so closely the day I have chicken bones to cook. This week is sponsored by Sugar and Spice Market! They are giving away a package of their gluten free sugar cookie mix and a package of their gluten free pancake/waffle mix! It is just in time for the holidays! I just finished making turkey broth and canning it. I love both broth and stock and would find it hard to make it through the winter without it! Thanks so much for sharing in our recipe linky. Don’t hesitate to share any other recipes you may post this month. Have a great week! What a great recipe! This really is a good one to know! You are so talented!! We hope you will come back this week! Thanks so much for sharing at Wednesday’s Adorned From Above Blog Hop. This weeks party starts at 12:01AM on Wednesday and runs through Sunday night. Have a great week. We love to make chicken stock but I never thought to make it in the crockpot–thank you for this recipe! Interesting about pureeing the bones too, never thought of that. Thanks for linking up at Thrifty Thursday! 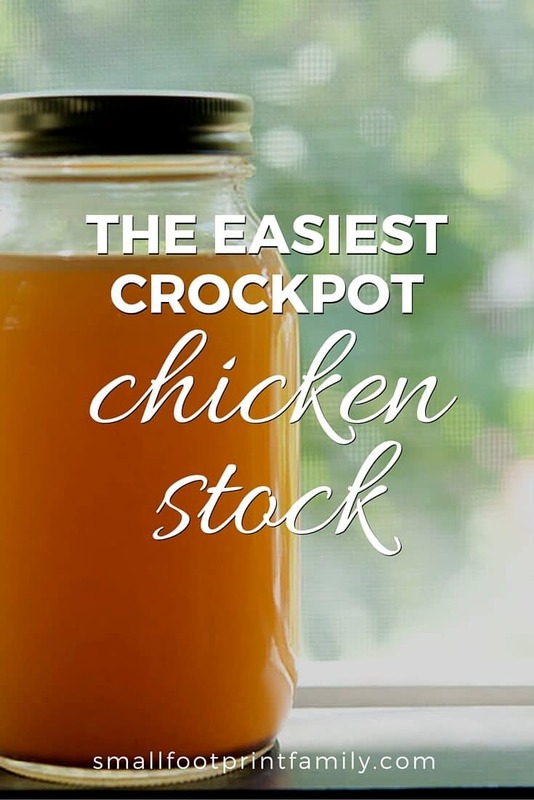 Your Chicken Stock looks so rich and delicious, I will be giving your recipe a try. Hope you are having a great weekend and thank you so much for sharing with Full Plate Thursday. How do the pureed bone affect the taste and texture of a soup? I’d like to try, but I don’t want to make something my family won’t eat. I strongly flavored soup like squash or leek, you might not even notice. However in a clearer soup, the taste might be unusual for some. Looks amazing! I think I will go heat myself up a cup of turkey stock right now! I hope you will share this with Simple Meals Friday! I love your post! It’s very informative! I followed this same technique with our leftover Thanksgiving turkey carcass, and it was so delicious! I like the idea of brewing it 2 times – very cost effective! There’s nothing better than homemade stock. I make mine in the crock pot all of the time as well. I am giving away two great prizes on my blog: a $50 gift certificate to my favorite jeweler robinsonlane.com and a copy of a new book published by fellow blogger, Kat Robinson. It is called Arkansas Pie: A Slice of the Natural State. I just know you will love either one. http://diningwithdebbie.blogspot.com/2012/11/2012-merry-merry-munchies-3-baked.html Come link up to enter. I totally needed this! I’ve always wondered the difference between broth and stock lol. Thanks for an informative post (as always!) and for the recipes! Homemade stock/broth is definitely wonderful and a great way to use all the chicken. I love having portions in the freezer. You give some great tips – like saving vegetable scraps and roasting the bones. Thanks for posting! Thank you for the info and recipe. I never realized the difference between stock and broth. Thanks for the education. Such great information. I never knew the difference between stock and broth. I love the tip about roasting the bones and veggies again. Can’t wait to try it. I make bone broth every time I cook a chicken, but never thought of using the bones a second time, so I’ll try it next time. Thanks! Oops, I should’ve said stock! I’ve always called it bone broth.